The Tree People send you greetings! The Tree People call to you to remember them. They, too, are your family and you know them very well, although perhaps you have forgotten this relationship. They are ready to assist you in consciously remembering that connection and they are eager to commune with you. This is “Tree People I: Mara”, the first of the Tree People series, inspired by “Tree Talk“, written/channeled by Dianne Robbins. 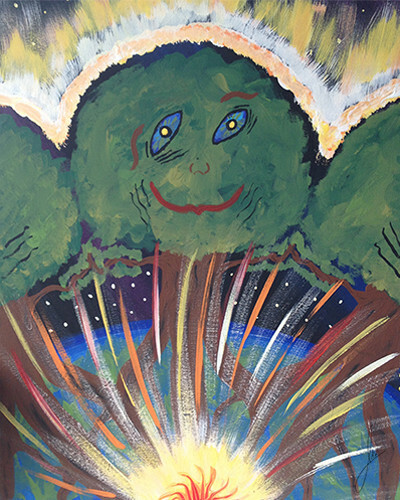 The book and the idea of the Tree People sparked my imagination and I started a painting, which turned into a series of three paintings, representing the Tree People. This first painting is Mara, a tree being who feels so loving and gentle and kind to me. She feels like a friend, like family, with the wisdom of the Universe in her eyes. I really enjoyed tuning in to the energy of the Tree People, and the paintings flowed so easily! These were really fun to create, it was a bit like they created themselves. We want to remind you that you are not alone here on planet Earth. Indeed, you are just one of many conscious species who call Earth home! You can connect to the consciousness all around you at any time, and we strongly encourage you to do so. This is the first painting in my Tree People series. You might also enjoy Tree People II: Treesome and Tree People III: Collective.